Help eliminate standing water and prevent rust and on electric tongue jacks. 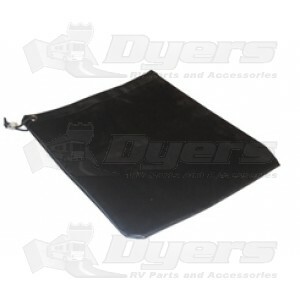 Durable vinyl fabric with draw string fits most jacks. I purchased this cover to protect my new jack. The old jack was only a year old when it quit working. The plastic cover came off during the winter and water went into the motor and seized it. This new cover is perfect to keep the weather out, and it is a small price to pay compared to buying a new jack. Excellent product!!! !